The importance of South-South and triangular cooperation in accelerating sustainable development has gained continued momentum over the last decades. There is growing consensus around sharing ideas, knowledge and skills to address common challenges and build shared strengths. Developing countries are increasingly recognizing good practices in South-South and triangular cooperation as viable pathways to accelerate progress in the attainment of the 17 Sustainable Development Goals (SDGs). The new surge in South-South and triangular cooperation has also seen countries in the South increasingly championing solutions that address common transnational development challenges which would be difficult to tackle independently. In this sense, the United Nations Office for South-South Cooperation (UNOSSC) included the ILO Academy on Social and Solidarity Economy in its most recent compilation of success cases. The SSE Academy was chosen due to its capacity of building regional and interregional networks and platforms for knowledge and experience-sharing, and due to its potential of contributing to the attainment of the SGDs. The ILO has built a long tradition and developed a thorough expertise on SSE enterprises and organizations and believes that capacity building experiences such as the SSE Academy can help to strengthen continental and inter-continental networks in the field of SSE. 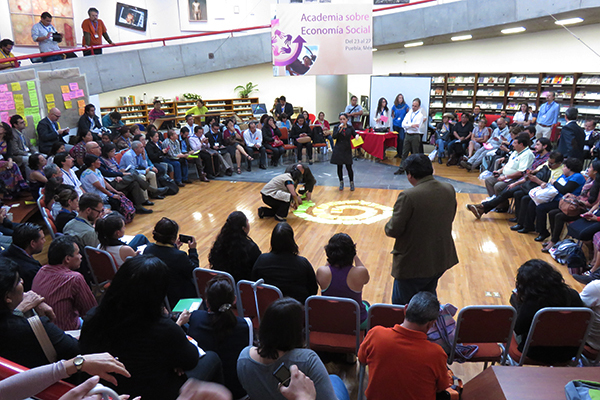 The concept of Social and Solidarity Economy (SSE) cuts across all four dimensions of the ILO’s Decent Work Agenda. The SSE has a distinct and valuable role to play in finding solutions for job creation. It can help to cover the needs of members which have been ignored or inadequately addressed by the private or public sector, creating a strong, sustainable, prosperous and inclusive society. South-South and triangular cooperation, based on the principle of solidarity and non-conditionality, can be regarded as a SSE compatible approach for sharing knowledge, experience and good practices, and for supporting capacity development, technology transfer, as well as resource mobilization. The UNOSSC compilation can be accessed << here >>. The SSE Academy case can be found in the pages 135 and 136. Fore more information about ILO’s activities in the Social and Solidarity Economy, visit its virtual interactive space called SSE Collective Brain.